Last night, Zayn Malik was spotted giving girlfriend Gigi Hadid a sweet kiss on the head after a night out at celeb hotspot The Nice Guy in West Hollywood. Zayn took some time off from his “Pillowtalk” promotional tour to spend time with Hadid, who is his love interest in the video. Malik recently confirmed that Hadid was his girlfriend during a radio interview with Zach Sang & the Gang. When a fan asked if it was cool to have his girlfriend in his music video for “Pillowtalk,” Zayn responded with some hesitation, "Uh, yeah. That was cool. it was something different. We enjoyed it. It was fun.” Watch! 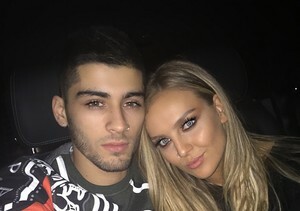 After hearing his response, one of the co-hosts followed up by saying "No one easier to make out with than your own girlfriend, right?” Zayn replied, “Exactly." Zayn’s confirmation came just one week after he dropped the “Pillowtalk” music video, which features him kissing Gigi multiple times.